SCVHistory.com LW3032 | Business | First? 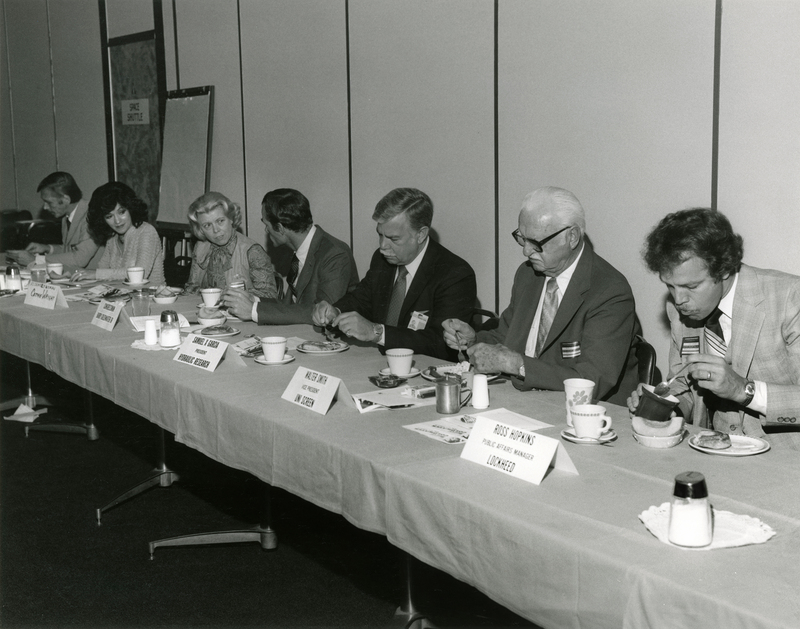 Valencia Industrial Association (VIA) Luncheon, 1981 or 1982. One of the first monthly luncheons (possibly the first) of the Valencia Industrial Association, 1981 or 1982, held at Hydraulic Research-Textron (later Woodward HRT). Note the "Space Shuttle" door at left. The Valencia Industrial Association was organized in 1981 to represent the interests of businesses in the Valencia Industrial Center and later Valencia Commerce Center. It was subsequently renamed Valley Industry Association to reflect its growth as an organization representing industrial, commercial and service companies across the Santa Clarita Valley. • Craig Johansen(? ): Vice President of Marketing, HR Textron (1980-1996). • Connie Worden (later Worden-Roberts): VIA executive director and public affairs manager for Hydraulic Research. • Assemblywoman Cathie Wright: Member of the Assembly from 1980-1992; member of the state Senate from 1992-2000. • U.S. Rep. Barry Goldwater Jr.: Member of Congress from 1969-1983 (representing SCV). Candidate for U.S. Senate at this time; lost GOP primary to Pete Wilson. • Samuel X. Garcia: President, Hydraulic Research. • Walter Smith: Vice President, Uni Screen. • Ross B. Hopkins: Public affairs manager, Lockheed Corp.
LW3032: 9600 dpi jpeg from original photograph, collection of Connie Worden-Roberts.